Go figure: The very first conversation between Washington and Moscow on the relationship between strategic offense and missile defense took place at Glassboro, New Jersey. 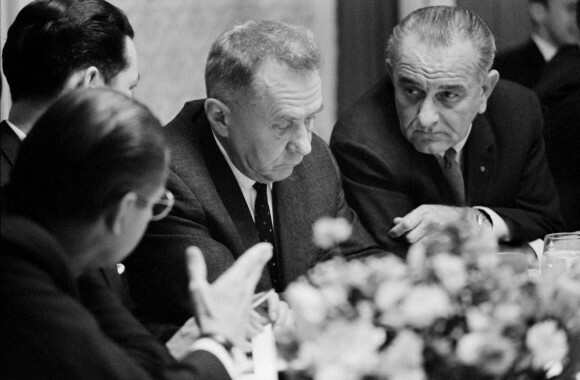 Soviet Premier Alexey Kosygin was visiting the United States in June 1967, and President Lyndon Baines Johnson arranged for him to listen to Robert McNamara discuss this subject over lunch. Secretary of Defense McNamara had the unenviable task of trying to contain an open-ended, interactive strategic arms competition marked by the prospective deployments of MIRVs and ABMs. As if this wasn’t hard enough, McNamara also needed to convince Kosygin that a defense of the Motherland was a bad idea. LBJ wasn’t inclined to buck hawkish sentiments on Capitol Hill and among the Pentagon brass, but there was no harm in allowing McNamara to try. Kosygin normally wore a poker face. 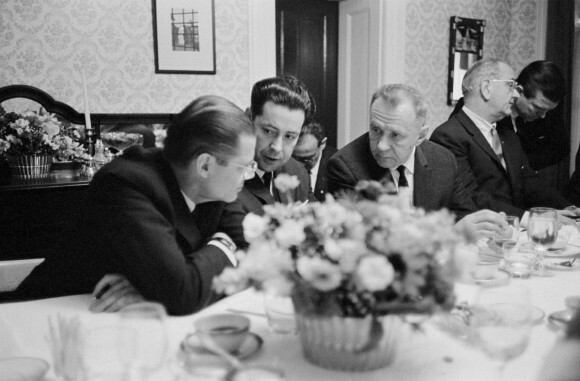 Perhaps he initially looked at McNamara as if he were from a strange, distant planet. Then, in McNamara’s recollection, “He absolutely erupted. He became red in the face.” McGeorge Bundy recalls otherwise in Danger and Survival — that Kosygin “had himself a good time” arguing what was then the standard Soviet line, that defense was a moral imperative and that a nuclear arms race was immoral. What subsequently transpired, of course, was that the United States and the Soviet Union pursued both MIRVs and ABMs – the former in large measure, the latter in very limited fashion. Washington and Moscow subsequently traded positions on the morality of national missile defenses. Ed Ifft, a former State Department official who sat in on his share of negotiating sessions, has noted, with great irony, that the two superpowers often embraced the same position in arms talks, but rarely at the same time. Interesting tidbit of Cold War history. Thanks! “Russia and the West must reach a suitable agreement on the issue of missile defense in the next decade otherwise Moscow will have to adopt and deploy new strategic weapons, President Dmitry Medvedev said on Tuesday. Either side needn’t bother: midcourse missile defense is non-functional, as shown by the latest GMD FTG-06a test failure and as attested to by the latest GAO report on the subject. Further, even if it did reach a high degree of functionality in the possible distant future, only a small probability of a nuclear missile coming through the defenses is sufficient to deter us, and the Russian. “it will be tough for Obama to let go of missile defense because until now, the discussion has been framed in such a way that it’s implicitly assumed that missile defense is a fundamentally useful thing—as long as it can be made efficient and built at reasonable cost without damaging the prospect for nuclear disarmament, of course. In short, the argument often is that the current missile defense system is flawed, but if those flaws could be solved, missile defense would be a great boon to international security. Missile defense proponents, of course, go much further, stating that missile defense provides a reliable (and some insist the only) way to counter emerging missile threats. As long as US and NATO adversaries have nuclear weapons, we should not discourage them from mating them to ICBMs. I agree with Taylor that this is an interesting tidbit! Respectfully, I disagree with Yousaf on a few points. The New START treaty was an easy no brainer because it was unnecessary in the context of US and Russian relations. Unilateral disarmament of nuclear weapons to much lower levels than described in that treaty is a thinkable thing now. Americans do NOT go to sleep fearing Russians or their nukes, and vice versa. New START was, however, an opportunity for a photo op to get credit for things we were willing to do anyway (Yawn). As for the Russians… they are shrewd at the art of bargaining. I must ask, why with all the advisers and top scientists at President Medvedev’s disposal, do the Russians worry about American missile defenses… especially if they won’t work, or if they will break the American piggy bank (already broken, though it is)? Is this some Russian tactic to gain concessions later on other matters of foreign relations? Cheers to all on this first blog of 2011! “I must ask, why with all the advisers and top scientists at President Medvedev’s disposal, do the Russians worry about American missile defenses… especially if they won’t work, or if they will break the American piggy bank (already broken, though it is)? Good question. The answer is yes. No one is really worried about the ability of our missile ‘defenses’ to hit their warheads — we cannot even hit our own when we know when exactly they are launched and which trajectory they are on and what the IR signature of the (known) decoys are! The Russians take advantage of our fielding unworkable missile defenses to gain concessions and pressure us. The real question is why do we pursue unworkable missile defenses in light of the shrewd Russians tactics to pressure us? Perhaps lobbying by Heritage and Raytheon has something to do with it. I suppose if I wanted to be nasty I could say that Americans did not to go sleep fearing al-Qa’ida on Sept. 10, 2001, or the Japanese on Dec. 6, 1941, either. I don’t know how much faith you can have in public focus as an indicator of what matters. More pertinent, however, is whether the US can unilaterally decide what is irrelevant to US-Russian relations if the Russians disagree. I’m not so sure we can say that no Russian general goes to sleep fearing the United States. Douglas Feith devoted about one and a half pages of his memoirs to relations with Russia. (His focus shifted elsewhere, but he briefly had responsibilities in that area.) What was striking about it was his continued insistence, writing in about 2007, that US-Russian relations could be rebuilt (or could have been rebuilt) on the basis of shared interests when every “shared interest” that he listed was something that the Russians had consistently and vociferously denounced. He was talking about shared interests in missile defense and NATO expansion! When the Bush administration first suggested that we could build BMD jointly, the response of the chief of the Russian General Staff was, “We’re not going to participate in a project that’s directed against us!” The Bush administration, of course, was out to change the world and was especially reluctant to accept reality as a given; but even beyond the Bush people there’s a strong assumption (probably never considered explicitly) that we can decide what the world’s reality is, who the good guys are and who are the bad guys are, and which aspects of the past continue to be relevant and which have lost their validity. US-Russian relations aren’t bad now, but if you never take the other side’s views into account–never even bother to find out what they are–how can you expect them to remain that way. I wouldn’t be so sure. Professional threat analyzers always assume the other guy’s stuff will work. Just look at the assertions made by people like the Committee on the Present Danger about what the Soviets could do. Your comments rest on the extremely false assumption, often shared by many, that there is one true story about Russian or American intentions, perceptions, beliefs, or course of policy. In reality, all political systems are, to a greater or lesser degree, pluralistic in being made up of diverse persons and groups having different perceptions and levels of comprehension, different philosophies, intentions, beliefs and interests. Often history turns on the rise in influence of some people and decline of others, and that is one of the key ways that our actions can affect theirs and vice versa. Often there are significant time delays and the effect of today’s American policy decision on Russian or Chinese or Iranian policy is not felt until some years later. You say the Cold War is over but for some reason these obscene arsenals that threaten human civilization and all life on Earth continue to exist and demands that they be downsized and dismantled are fervently resisted. You say “neither party has any interest in a renewed arms race” but in fact there are many parties within each nation who do have personal and organizational interests in the pursuit of arms competition and in the exaggeration of threats posed by others. You say that a Russian rearmament will meet with no response from the US — really? And if the US would have no concerns about a (mythical, magical) “impenetrable missile defense” — or some other means of neutralizing the US nuclear deterrent, then why wouldn’t we just go ahead and disarm unilaterally? Frankly, such arguments are implausible. I am glad that you think unilateral disarmament to much lower levels would be reasonable now, but honestly, if the Russians did not reciprocate, I doubt we would go very far. What would of course be much better would be another round of deep, mutual, verified and binding cuts, and serious groundwork toward a world of zero nuclear weapons. But these would be positive actions, and what would make them plausible and workable would be precisely the effect they would have on the whole spectrum of perceptions and interests and the political power balance on all sides. A global revolution of hope, coupled with concrete actions, could be a self-sustaining virtuous cycle. But this will not likely happen by default, not with any surety and not with any speed. I can’t read the mind of Medvedev but I am sure that at least some Russians, particularly within the military, are still deeply distrustful of the US and of US motives in still pursuing military superiority at the strategic level with missile defense (which you profess to believe in), advanced conventional weapons, robotic weapons, etc. No nation is ever of one mind. Nor do those many minds operate in isolation from the rest of the world or most especially from those they are most wary of. In fact, even though midcourse strategic missile defense would be ineffective in neutralizing the threat of our potential adversaries’ nuclear-tipped ICBMs, it could still partially impact the stockpile calculations of, e.g., Russia and China. e.g. A 25% effective strategic missile defense provides no credible effectiveness in neutralizing an enemies’ deterrent since even a few nuclear tipped ICBMs making it through are sufficient to deter us. However, a 25% effective missile defense means that China and Russia could have a legitimate basis of increasing their stockpiles by at least ~25%. Conservatively, they could increase it by, say, 50%. 43 Aegis ships (i.e. mobile platforms) with 436 interceptors. No one has put the issue of midcourse missile defenses to bed with arguments that they can’t possibly work without violating the laws of physics… given that testing has demonstrated that roughly half the time they do, in fact, work. At this point, the effort is merely tweaking the system to increase reliability and the robustness of counter-countermeasures (CCMs)—never an easy phase of testing for any system. Who knows, perhaps the Obama administration has been touting missile defenses because they intend to use them to pressure the Russians to gain concessions. I do like the discussions underway between NATO and Russia to work European missile defenses together. That’s a great TCBM. Your points are well made. Kudos! I do think the Russians got shafted with the NATO expansion eastward. And yes, the Russians do get to decide for themselves what irks them. But there is no propellant towards war between them and the US. Missile defenses are certainly not such a propellant. There is no pretense that it is done in the name of deterrence, but rather of defense. The scale of that defense gives a clear indication that it is NOT a threat to the massive Russian arsenal. The Poland basing wouldn’t even come into play if the Russians launched over the pole against the US. It would come into play, however, if the Russians intended to launch one or two missiles at Western Europe. I suspect this thought occurred to the Europeans when the Russians reacted as they did to initial proposals to base missile defenses in Poland. Suddenly, Europe has warmed up to the concept of missile defenses. I didn’t see that coming! Neither Heritage nor Raytheon were lobbying there! You are right, once again, that threat analysts usually assume the other guy’s stuff will work. They know our midcourse missile defenses work roughly half the time and promise to improve their reliability. Now is a great time for the Russians to partner with NATO for missile defenses. We should ask them where else they might like to see missile defenses based and operated in partnership. They might suggest southern Canada or Cuba. That sounds reasonable. Happy new year to you, too. I hope you had a nice celebration. You are quite right to point out the risk of treating states as unitary actors on the international stage. Within their borders there is usually an ongoing debate between many factions and organizations with numerous agendas. Still, the strategic culture of states inclines them towards certain national styles of dealing with international issues. You and I are not so far apart. I agree that the US and Russian stockpiles of nukes are far too large for any practical purpose, and that New START gives a nice opportunity to verify reductions—a matter of far greater concern to the arms control community than to the military. There is, indeed, the political environment in the American and Russian governments to be considered. Many factions do not want to see unilateral disarmament, but these voices are becoming increasingly disconnected from the reality that there is no context for war between the US and the Russians—the large stockpiles have little value in achieving contemporary aims of policy. So we’re back to disarmament treaties that are essentially unneeded for anything other than a photo-op for things we were going to do anyway. There is an error in your thinking that the US is attempting to achieve military superiority through missile defense. Such a system is purely defensive and cannot be used to impose one’s will over an adversary. It may, however, prevent an adversary from imposing their will on the defended. But in war there are always a plethora of lines of operation being engaged. No one ever said missile defenses would be perfect. Even if it were only 25% effective, the 1 out of 4 cities that would save would be grateful! But before it gets to that, it would certainly curtail the blackmail efforts by rogue states. You raise the issue of the Chinese. It is long overdue for us to turn the rather myopic US/Russian START process into a multilateral set of negotiations with all nuclear powers. We can apply what we’ve learned in our ongoing disarmament efforts to help reduce other stockpiles. There is increasing reluctance to rid the entire US stockpile given the proliferation efforts underway in several countries. It is time to bring the international community together on this. We will discover, however, that most countries with nukes like them and will keep them. It seems we are fated to a world with some nukes, some missile defenses, some arms control, some friends, and some enemies. There seems to be a balance. It is fundamental physics — the sensors rely on IR and radio discrimination. Using simulation and anti-simulation, one can deny the defender information needed to discriminate between CMs and real warheads. The proof is in the pudding: no missile defense test with CMs has been a success and many without CMs have also not succeeded. 60+ years of funding at billions of $/yr will not change physics, much as you may wish to thrash your arms about and kick and scream that physics can be altered. That said, the drone-based proposal is one that could perhaps work, though I doubt it will approach even 50% effectiveness — it has a host of its own problems. This shows a deep lack of understanding — no-one is proposing that nuclear arms will be for war-fighting. That said, even 25% effectiveness is wildly optimistic. The empirical data for success rate of MD against countermeasures is 0%. The empirical data for success rate of MD against all intercept tests including countermeasures is <50%. Since it is simple to put 10 balloons on a rocket and put the warhead in a aluminized mylar balloon also, the effective success rate drops to <5%. Since the tests to date are "blue-team vs. blue-team" and not "red-team vs. blue-team" i.e. when the intercept team would be in the dark about when a missile would be headed their way and on what trajectory and using what CMs we can further estimate that a factor of 10 will be lost so that the success rate would be ~0.5%. Further, the Aegis has not been tested in rough weather, nor when the sun was shining at a disadvantageous angle to confuse the sensors. Lastly, if Dreamworks or other people at MDA have counter-counter measures, it is a puzzle why they don't use them to lift up their abysmal failure rate in blue-team vs. blue-team tests to date. i.e. a 100% failure rate in all tests with countermeasures. Yes, yes, just a few decades more and another $867 billion, right? This is an interesting discussion, with a seeming support for the McNamara Department of Defense trying to talk the USSR out of missile defenses because of arms race threats and their belief that Mutual Assured Destruction was the best course of action. If that concept is to be believed as the right course of action (of which I do not believe this to be the case)and the US-Russian NEW START is so great a step forward, then why as Coyote (and others)rightly points out, wouldnt we be better off to have a multi-lateral agreement to reduce nuclear arms and possibly expand the MTCR and other ICBM technology proliferation prevention (attempted) institutions? Or for another stimulation of the discussion, not as an advocate regarding missile defenses….if a LAYERED missile defense is not “workable” because it has failed (Mid Course only has been tested by itself, no full up test or deployment of such a system has been conducted…the results might be better if tested as such) “half the time”, then why dont we just deploy more nuclear weapons rather than cut them, since more nation states are wanting and developing nuclear weapons, those that have far worse relations with us than Russia? In the Cold War the whole reason (one at least) for having so many nukes and bases and delivery systems was to ensure survivability of retaliatory options for second and third strikes. If the Cold War between two nations (US and USSR) is “over”, yet we have more countries that claim to be enemies of the United States with ICBM technology and nuclear programs (and some with active bombs), then wouldnt it be a better nuclear defense strategy to build larger stockpiles and ICBMs to prevent a multi-front attack? Personally, I am not advocating such a move and would prefer putting that money in a sound LAYERED missile defense system, and working out the issues so we can protect that 1 or 2 (or more) cities out of 4 from a missile attack. Trying to play catch up when all the money we could have used from our economic instrument of national power to do so, was instead spent on paying for the clean up of the disaster areas of several ground zeros across America would be a waste of planning opportunities! To me, the risk of cost issues and security are are far greater if we keep considering missile defenses as something that doesnt work. One final point. This argument that missile defenses dont work, doesnt fly from a historical point. Many technological developments didnt just start working the first time, first month or even first year they started design and testing. Our rockets that became ICBMs and space launch vehicles blew up for many, many years! The now “reliable” Space Shuttle Main Engine blew up quite a bit in the 1970s during testing, and many other programs as well. Rather than having solid information to back up claims in this thread, it might be a good idea to quote from primary sources rather than news articles or editorials, than secondary sources. There is promise in missile defenses if we will look carefully into the joint program options articulated from Presidents since Reagan. Coyote’s point that we are in a period of “some nukes, some missile defenses, some arms control, some friends, and some enemies. There seems to be a balance” might be a good synopsis of our situation. Multi-lateral treaties will probably be a good option to go hand-in-hand with layered missile defenses. I see Amy beat me! MK: may I respectfully suggest that unless someone brings a really novel new idea or information to the debate that you consider more strenuous moderation. I do suggest a thirty day moratorium on BMD debates. When you speak of things that the Pentagon’s missile testers know and that outside specialists like Postol shouldn’t–or can’t adequately–comment on, are you saying that you know something in particular that you can’t discuss in public or are you making informed assumptions about what must be going on behind the scenes? Thank you Amy — I concur 100%. The argument that anyone would actually use ICBMs to attack the US with nukes (the 1 city out of 4 mentioned above) is ludicrous. ICBMs have a clear return address, so if anyone actually wants to nuke you they sail in their nukes or use other delivery methods that leave a less clear trace of where they came from. The argument that missile defense does anything for being potentially blackmailed is equally flawed: if the defensive system is imperfect — any system is imperfect — you will be equally well blackmailed with it, as you will without it. No US president will say: oh heck we have a 25% effective defense — bring it on! You will be blackmailed in any case. (OK, maybe President Palin would). If people bothered to read the articles cited above before zealously composing their posts they would be aware of these oldthink flawed arguments. I agree with Michael and will make one last stand and then will be happy to get off the stage on the topic of missile defenses for 30 days. Like the GAO, we can complain about the cost, program delays, and the efficiency of management–quite worthy criticisms (I have PLENTY), but only the people within the Obama administration and their departments have the complete information to determine if missile defenses are worth pursuing. I am exceptionally confident that President Obama and his teams have been quite thorough on these matters. I am also confident that our Russian partners and allies have been equally competent in their assessments. Missile defenses are as real as nuclear armed intercontinental ballistic missiles. Love them or hate them, they are in the mix now. I have every confidence in President Obama and his team to get this right. Please, be of good cheer. All is well. Yes, but one problem is that technical information isn’t the only factor (or possibly even the main factor) that goes into procurement decisions. Sometimes political decision making is . . . , well, political. Sure — so is corruption in Afghanistan and so was the flawed idea to chase WMDs in Iraq. Every government decision is not sensible. The point is that whatever magic CCM devices the MDA and Dreamworks have, they have not been working in actual tests. This vidicates the view of the critics. Far from sowing doubt in the enemy, missile defense due to its enormous failure rate probably encourages the enemy. Missile defense is a huge waste of taxpayer money but I agree it will be pursued — as are many many other flawed government programs. Be in good cheer — arms company executives are getting rich at the expense of taxpayers and making the country less secure in the process. Be of good cheer Coyote! The point isn’t just that tests fail — in fact, according to the information released by MDA, they are not testing against the simple countermeasures that critics say will with certainty defeat the MD sensors. Coyote throws up clouds of dust suggesting that MDA is lying about the actual mix of elements in these tests, without actually saying that they are lying. The short version of the story is that the tests do not include decoys which are shaped like warheads; the only “decoys” they use are spherical balloons which can easily be discriminated from conical warheads. So when they claim they are testing against “countermeasures” they are pulling a cheap con man’s trick and getting away with it only because nobody in polite Washington has the guts to call them out on it. However, the other trick they don’t test against is to hide the warhead inside a spherical balloon, and put out lots and lots of balloons, all of slightly different sizes and maybe even different odd shapes instead of spherical, so that there is no way to tell even by some slight difference in signature which one contains the warhead. As you may know, aluminized mylar balloons are opaque to microwave (radar), IR and optical radiation. So you can’t see what’s in them using the sensors MDA tells us it is using. Coyote suggests that the physicists don’t know what other sensors MDA might be using, without actually saying there is another type which they are using. However, there is no known physics for another type of sensor that could be used in space at thousands of km distance. So, the physicists’ case can be made without access to whatever secrets MDA may or may not be hiding. These basic reasons why midcourse defense can always be defeated have been known to the government since the mid-1960s and have been extensively discussed publicly in the context of missile defense since the 1980s Star Wars days. This iron-clad case against the very systems the Bush and now Obama administrations have decided to deploy has been reiterated and reiterated only to meet the same befuddled puzzlement of politicians and smirking silence of generals. Honest weapons scientists, including the Dark Lord Edward Teller’s acolyte Lowell Wood have openly admitted this is true. And yet the program plows ahead and Washington (including prominent arms controllers) pretends that’s not an elephant braying at the side of the room. And on the political end there is a real danger that politicians might believe the MDA that it has a real defense in place when it doesn’t. So if/when NK gets an ICBM MD should not provide any level of comfort — if it does you are being misled or are being misleading. And if it does not provide a level of comfort for the US what is the point? And no, it is not that a partial defense provides a deterrent to NK using ICBMs: that deterrent is provided by our ICBMs, not leaky missile defenses. Although Pavel ignores the political way in which MD can be used against us.